The symposium, accordingly, had two principal objectives. The first objective was intellectual: To bring the knowledge and insight of world and international history and theory to bear upon the idea and problematic of ethnicity and other associated issues. The second objective was more immediate, political and ‘practical’. The symposium aimed to give a more solid foundation to Nepal’s federal structure than has been possible so far, by providing information, knowledge and insights on the interface between ethnicity and federalization. These two objectives were to be attained mainly by enriching public education on ethnicity and devolution of power among and through the members of the constituent assembly, politicians, ethnic activists, journalists, civil society actors, academics and others. The symposium has resulted in a variety of physical outputs. The first is the volume of proceedings of the symposium which brings together all of the 25 papers presented there, including the keynote address of Professor TK Oommen. While some of the authors have sent in the final version of their papers, most of the authors are currently revising and finalizing their contributions. It is expected that all the authors will send in their final version by 15 September, 2011. We expect that the volume can go to the press by the end of October 2011. The second output is an approximately 100-page compilation of a Nepali language summary of all the presentations. The compilation summarizes each of the papers in Nepali in 2-3 pages. Each of the papers also comes with a short, approximately one-half-page summary of the key questions raised and response provided during each of the presentations. The symposium also organized a panel of six CA members and political party leaders on the theme of ethnicity and federalization and this compilation also contains a summary of presentations made in the panel. The third output is a volume which contains English as well as Nepal language abstract of the presentations made during the symposium. The fourth output is a set of audiovisual CD recording of each of the presentations. There is also a much briefer, approximately 2-hour summary version of the CD recording available. The CDs also contain some of stories in the media on ethnicity and federalization before, during and after the symposium. Several of the media also carried interviews with the organizers of the symposium. There was also a substantial number editorial-page commentary on the theme of the symposium by journalists, academics and politicians. It may be noted that the symposium received wide coverage in the press as well as in the electronic media. The fifth output of the symposium was the organization of the dissemination and sensitization seminar in August 2011 which was attended principally by CA members, senior civil servants, available paper writers, and a few academics, ethnic activists and journalists. To summarize, we believe that among the effects of the symposium, particularly for the academics, has been an enriched base of knowledge on the shifting interface between ethnicity on the one hand and other key features characteristic to Nepal as well as the world today. It is expected that this will lead to better teaching, learning and frontier-level research within and outside of Nepal. The wealth of ideas and strategies discussed during the symposium together with the deliberately created space for enhanced participation of ethnic activists, political leaders, and CA members has had, we believe, important consequences for the ongoing deliberation on ‘state restructuring’ in the CA, the CA committees and individual members of the CA. We believe that the deliberations will continue to have salient significance during future deliberations on the theme in the CA as well. Even as a couple of members of the CA thought that the symposium was a bit too late to influence the sequence of deliberations on the theme in the CA, both the chairperson of the CA, who inaugurated the symposium, and chairperson of the powerful Constitutional Committee of the CA, who chaired the closing session, asserted that the symposium was timely and could provide valuable inputs to the CA and its committees. It should be noted that the fourth day of the symposium was planned as a day of interaction among CA members and the paper writers. A sizable body of ethnic activists, journalists and academics also participated intensely during the discussion. A total of 25 eminent social scientists presented their paper during the Symposium, among whom 12 were from Nepal and 13 internationally based. Almost all of the contributors had extensively published on issues related to ethnicity, polity, economy and culture of Nepal. In addition, more than 25 eminent social scientists and public intellectuals moderated and rapporteured the sessions. (See Annex 3 for the schedule of symposium and the identification of paper writers, moderators and rapporteurs.) Most, although not all, of the contributors were anthropologists and sociologists. 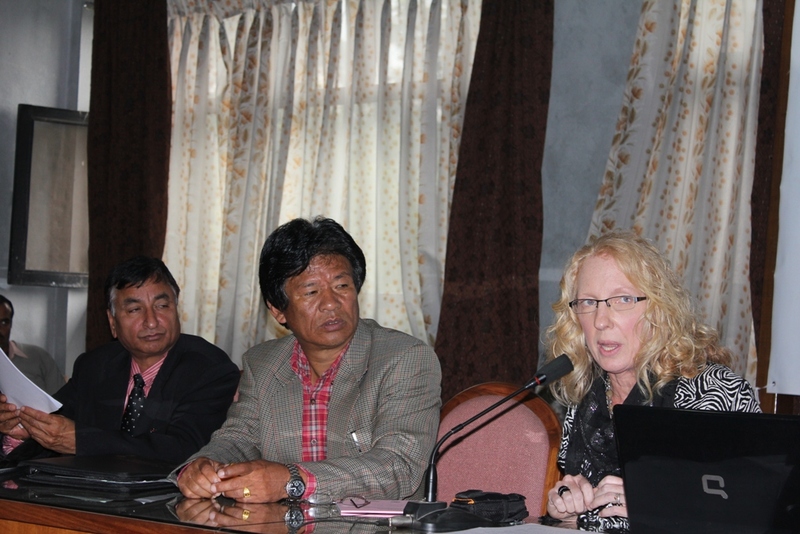 The Central Department of Sociology and Anthropology (CDSA) of the Tribhuvan University, Kirtipur, Kathmandu, was the host institution for the symposium. The organizing committee was led by the CDSA. The members of the organizing committee were: Chaitanya Mishra, Professor of Sociology (Chair; Ganesh Man Gurung, Professor of Sociology and Chairperson of the Screening Committee of the Social Inclusion Research Fund; Manju Thapa Tuladhar, Lead Adviser of Social Inclusion Research Fund; Ram Bahadur Chhetri, Professor of Anthropology; Suvash Darnal, Managing Director of Samata Foundation; Om Gurung, Professor of Anthropology and Head of the CDSA-TU; and Yogendra Yadava, Professor of Linguistics. The Secretary of the organizing committee was Mr. Dinesh Prasain, Lecturer at CDSA. Mr. Tikaram Gautam and Mr Dambar Chemjong, both lecturers at the CDSA, and Sudip Nakarmi from the Patan Multiple Campus, Tribhuvan University as well as several staff members of ActionAid Nepal and the SIRF secretariat assisted intensively during the latter half of the process. It is a matter of deep sorrow to all who participated in the symposium that organizing committee member Suvash Darnal died in an accident on August 15. Suvash was an extremely gentle soul but he was fully dedicated to his mission. We pray that his wife and daughter and the organizations he worked for can find the strength required to overcome this tragedy and to proceed ahead with work and life even as they keep his memory intact. An advisory committee comprised of experts from collaborating and funding partners technically assisted the organizing committee. SIRF/SNV Nepal (funded by the Royal Norwegian Embassy in Nepal) was the main funding partner and coordinated the advisory committee and other co-sponsors which included ActionAid Nepal, Danida HUGOU and SUPPORT Nepal (funded by the Swiss Federal Department of Foreign Affairs). Rakesh Karna of Support Nepal, Jit Gurung of Danida-HUGOU, Bimal Phuyal and Raj Kumar Trikhatri of ActionAid Nepal were extremely helpful both in their professional and personal capacities. The host institution would like to take this opportunity to thank the members of the organizing committee, the advisory committee and the sponsors. The SIRF secretariat and Dr. Manju Thapa Tuladhar, in particular, deserve praise for visualizing the significance of this symposium early on, helping to take initiative to invite and bring together other sponsors and for managerially supporting the host institution through the project duration in a collegial and smooth manner. The symposium covered a wide range of issues related to ethnicity and to devolution of power, most prominently federalization on the basis of ethnicity. Among others, the presentation of papers and the ensuing discussion covered the history and restructuring of ethnicity in Nepal and elsewhere, evolution of the Nepali polity and states, ethnic hierarchization and struggle, indigeneity, generation of livelihood, ethnicity, ecosystems and natural resources, and the predicament of the Dalits and dalithood, including for the non-Dalits. In addition, the symposium carried out focused and intellectually and politically sharp discussion on the nature of ethnicity and its relationship with the nature of polity, state, economy and culture across society and history. There were wide ranging discussions, stretched over various sessions, on Marxist, modernization-related and class-related interpretation of society, power and state as also on social diversity-based modes of interpretation of society, power and state. There were also wide ranging discussions on the notions of nation and nationality, multiculturalism and pluralism, and on models of power sharing across localities, ethnic groups and nationalities. The notion and practice of ethnicity in Nepal was intensively discussed as was the nature of the pre-1950, 1950-1990, 1990-2006 and the in-the-making states of Nepal. It also discussed the ongoing deliberations and negotiations in the CA. As expected, there was substantive divergence in the interpretation of the 25 paper writers, not to mention among the 300 participants. There was divergence among those who worked outside Nepal as well as those working within Nepal. It is not possible, therefore, to arrive at a consensus on the principle issue of the linkage between ethnicity and federalization. This, of course, was not expected either. The CA should follow up on instituting an advisory state restructuring commission in which members can work without direct and overt political party intrusion. We believe that this broad-ranging consensus opens up the prospects for highly salient short, medium and longer term concrete and result-oriented political, legal, economic and cultural policies and programs which can effectively address ethnic and other subordination, inequality and discrimination and which can articulate and unite diverse ethnic groups within a new Nepali nation state. As noted, there was much diversity and richness in the ideas put forward during the symposium. It is not possible to capture the diversity in this summary. Instead, this summary seeks to capture the diversity in terms of two streams of ideas. The first stream emphasizes that ethnicity is fluid, unstable and changeable. It also emphasizes that all individuals and peoples possess multiple identities. It argues that in order to ensure that ethnic subordination is abolished and equal citizenship is created, the Brahmanic, ‘casteist,’ Hindu, monarchical structures and values must be delegitimized and illegalized in all domains of public—and, increasingly, private–life. Concerted political action can go a long way in delegitimizing such structures. The playing field must be equalized for all, including the ethnic groups and their members. The state must insure that all groups and individual citizens have equal rights. Politics and law must also be geared to dehierarchize existing structures and social relationships between ‘high caste’ groups, ethnic groups and indigenous nationalities as well as ‘low caste’ groups such that relationships of superordination and subordination among such groups on the basis of ascriptive criteria is severely weakened and abolished. Dehierarchization must imply equality of opportunities and, over the medium and longer term, progressive equality of results. Such opportunities and results must cover a broad spectrum of social institutions and lives including (a) cultural and symbolic features such as language and religion, (b) political condition and features such as voice, representation and power, and (c) economic features, such as ownership, employment, income, and human capability. This stream of thought can be traced both to the Modernist and Marxist world views. Both, it should be noted, possess a distinctly evolutionary, dynamic and processual outlook. The outlook prioritizes history and structure. This stream of ideas remains in favor of multiethnic and multicultural federal units who can change their identity as they continue to intermingle. The second stream of ideas argues that ethnicity is fluid but only within a certain limit, as evidenced by the political and cultural dominance in Nepal of a single social group, i.e. the Khas Brahmin-Chhetris across last 240 years. Diverse ethnic groups have, through this period been, subjected by the ruling groups which, in turn, has led not only to homogenization but also to a delegitimation of cultural resources and attributes, unequal access to public resources, power, and political and public office, and to inequalities in economic and livelihood related assets and opportunities. This stream of thought also emphasizes the subjective and lived experience of members of ethnic groups and indigenous nationalities who have been subordinated and marginalized. Subjective experience is not unreal. The subjective does not exist only in imagination. Subjective experiences are real because they guide action, beliefs and social relationships. People act not only within the context of history and structure but also with reference to their experience, memory and pain. This stream of thought prioritizes polity and culture (relative to the economy) as resources that are valuable in themselves and also as instruments which can be utilized to gain a better and equal well being. Because it emphasizes polity and culture, it favors federalization along monoethnic lines. It believes that such federalization not only corrects a ‘historic wrong’ but also unites nationalities and contributes to a more sensitive and effective governance. It was also agreed federalization in Nepal—of whatever variety—is not a panacea. Additional structures and processes need to be instituted to promote democracy, diversity, inclusion and well being in a new state of Nepal. The organizing committee and the host institution as well as the advisory committee and the sponsors believe that the symposium has been highly successful. Participants have let us know that they learned much from the symposium. The large-scale, salient, and stable presence of the media and their coverage of the events and messages of the symposium further buttress this assessment. While political process is fundamental to the nature of social organization and social life, intellectual, academic and research-based interventions are germane to a democratic, progressive, equity-dominant and equality-promoting political process. Intellectual, academic and research-based interventions can also be germane to a multisided and holistic assessment and strategizing. We believe that the symposium went some way in fulfilling this potential. Should there be a further demand for intellectual and social science intervention on this and similar issues, we would be willing to walk further along this line.